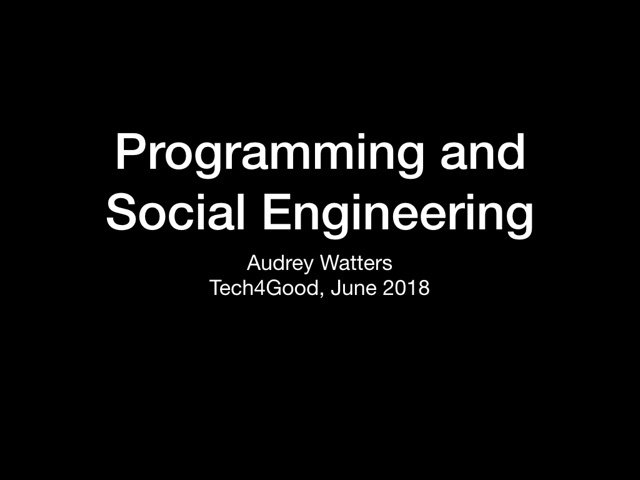 This is the transcript of the talk I gave at the Tech4Good event I'm at this weekend in Albuquerque, New Mexico. The complete slide deck is here. I actually want to make the case this morning that Skinner’s work – behavioral psychology in particular – has had profound influence on the development of computer science, particularly when it comes to the ways in which “programming” has become a kind of social engineering. I’m not sure this lineage is always explicitly considered – like I said, there’s that limited background in or appreciation for history thing your field seems to have got going on. 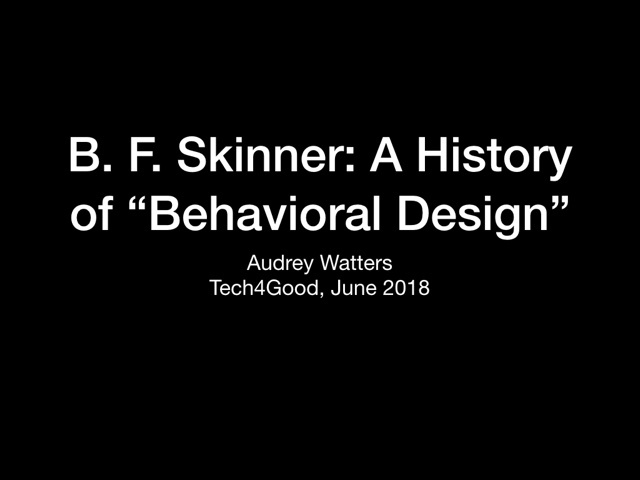 B. F. Skinner was a behaviorist. Indeed, almost all the American psychologists in the early twentieth century were. Unlike Freud, who was concerned with the subconscious mind, behaviorists like Skinner were interested in – well, as the name suggests – behaviors. Observable behaviors. Behaviors that could be conditioned or controlled. Skinner’s early work was with animals. 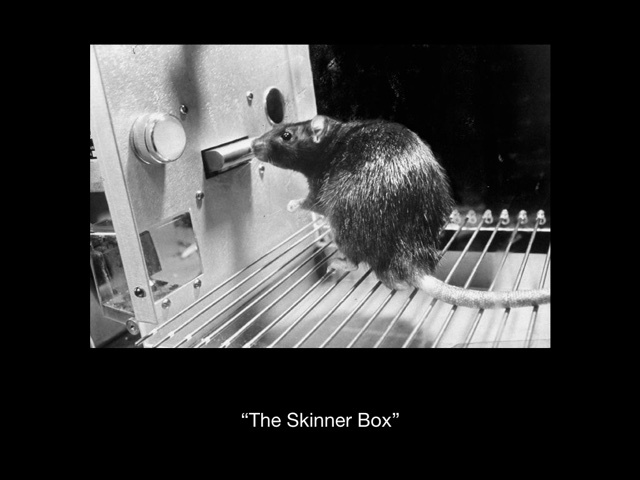 As a graduate student at Harvard, he devised the operant conditioning chamber – better known as the Skinner box – that was used to study animal behavior. The chamber provided some sort of response mechanism that the animal would be trained to use, typically by rewarding the animal with food. During World War II, Skinner worked on a program called Project Pigeon – also known as Project Orcon, short for Organic Control – an experimental project to create pigeon-guided missiles. The pigeons were trained by Skinner to peck at a target, and they rewarded with food when they completed the task correctly. Skinner designed a missile that carried pigeons which could see the target through the windows. 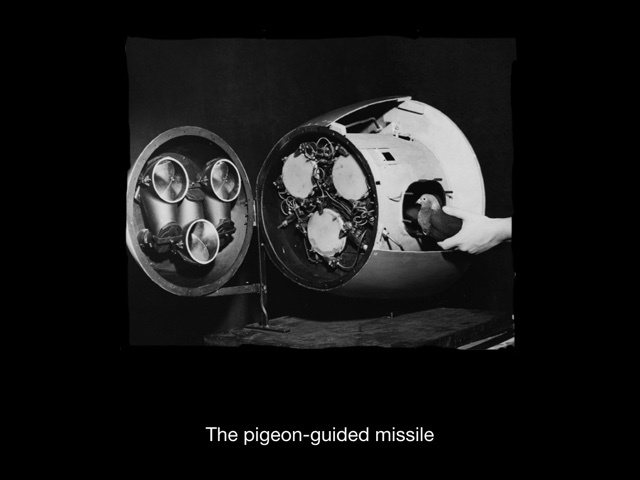 The pigeons would peck at the target; the pecking in turn would control the missile’s tail fins, keeping it on course, via a metal conductor connected to the birds’ beak, transmitting the force of the pecking to the missile’s guidance system. The pigeons’ accuracy, according to Skinner’s preliminary tests: nearly perfect. As part of their training, Skinner also tested the tenacity of the pigeons – testing their psychological fitness, if you will, for battle. He fired a pistol next to their heads to see if loud noise would disrupt their pecking. He put the pigeons in a pressure chamber, setting the altitude at 10,000 feet. The pigeons were whirled around in a centrifuge meant to simulate massive G forces; they were exposed to bright flashes meant to simulate shell bursts. The pigeons kept pecking. They had been trained, conditioned to do so. The military canceled and revived Project Pigeon a couple of times, but Skinner’s ideas were never used in combat. “Our problem,” Skinner admitted, “was no one would take us seriously.” And by 1953, the military had devised an electronic system for missile guidance, so animal-guided systems were no longer necessary (if they ever were). This research was all classified, and when the American public were introduced to Skinner’s well-trained pigeons in the 1950s, there was no reference to their proposed war-time duties. Rather, the media talked about his pigeons that could play ping-pong and piano. Admittedly, part of my interest in Skinner’s papers at Harvard involved finding more about his research on pigeons. I use the pigeons as a visual metaphor throughout my work. And I could talk to you for an hour, easily, about the birds – indeed, I have given a keynote like that before. But I’m writing a book on the history of education technology, and B. F. Skinner is probably the name best known with “teaching machines” – that is, programmed instruction (pre-computer). 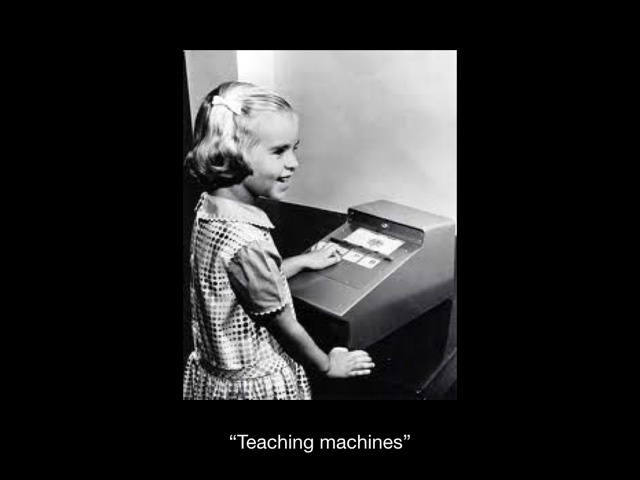 Skinner’s work on educational technology – on teaching and learning with machines – is connected directly, explicitly to his work with animals. Hence my usage of the pigeon imagery. Skinner believed that there was not enough (if any) of the right kind of behavior modification undertaken in schools. He pointed that that students are punished when they do something wrong – that’s the behavioral reinforcement that they receive: aversion. But students are rarely rewarded when they do something right. And again, this isn’t simply about “classroom behavior” – the kind of thing you get a grade for “good citizenship” on (not talking in class or cutting in the lunch line). Learning, to Skinner, was a behavior – and a behavior that needed what he called “contingencies of reinforcement.” These should be positive. They should minimize the chances of doing something wrong – getting the wrong answer, for example. (That’s why Skinner didn’t like multiple choice tests.) The reinforcement should be immediate. Skinner designed a teaching machine that he said would do all these things – allow the student to move at her own pace through the material. The student would know instantaneously if she had the answer right. (The reward was getting to move on to the next exciting question or concept.) And you can hear all this echoed in today’s education technology designers and developers and school reformers – from Sal Khan and Khan Academy to US Secretary of Education Betsy DeVos. It’s called “personalized learning.” But it’s essentially pigeon training with a snazzier interface. 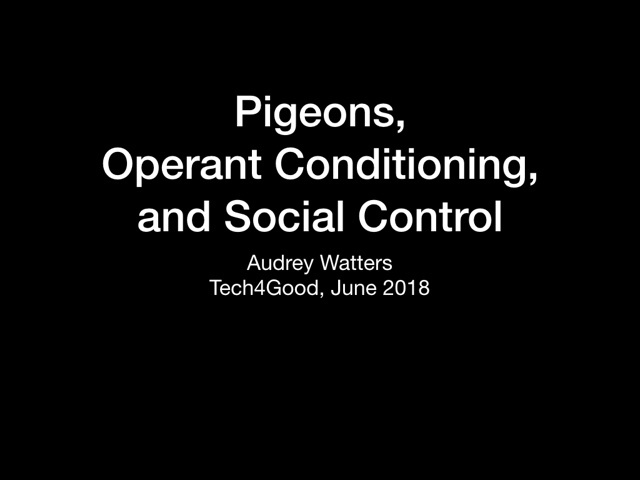 If we do not bring students’ behavior under control, Skinner cautioned, we will find ourselves “losing our pigeon.” The animal will be beyond our control. 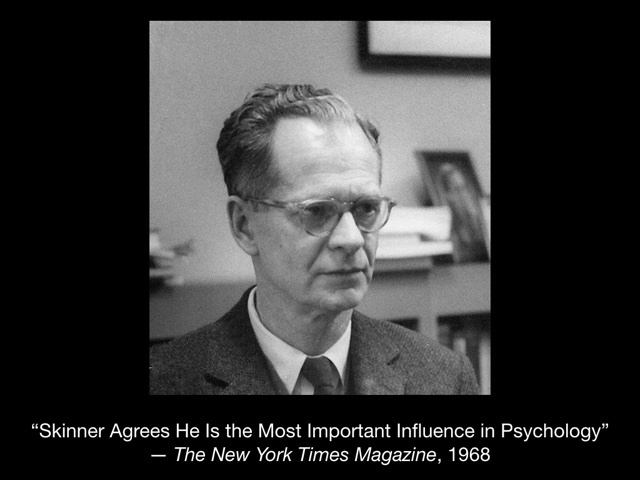 Among the discoveries I made – new to me, not new to the world, to be clear: in the mid–1960s, B. F. Skinner was contacted by the Joseph P. Kennedy Jr. Foundation, a non-profit that funded various institutions and research projects that dealt with mental disabilities. 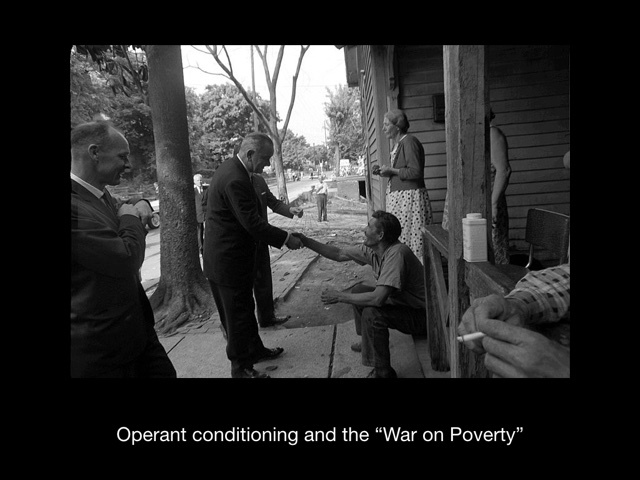 Eunice Kennedy Shriver was apparently interested in his work on operant behavior and child-rearing, and her husband Sargent Shriver who’d been appointed by President Johnson to head the newly formed Office of Economic Opportunity was also keen to find ways to use operant conditioning as part of the War on Poverty. Motivating pigeons or poor people or peasants (or motivating peasants and poor people as pigeons) – it’s all offered, quite earnestly no doubt – as the ways in which science and scientific management will make the world better. But if nothing else, the application of behavior modification to poverty implies that this is a psychological problem and not a structural one. Focus on the individual and their “mindset” – to use the language that education technology and educational psychology folks invoke these days – not on the larger, societal problems. I recognize, of course, that you can say “it’s for their own good” – but it involves a great deal of hubris (and often historical and cultural ignorance, quite frankly) to assume that you know what “their own good” actually entails. You’ll sometimes hear that B. F. Skinner’s theories are no longer in fashion – the behaviorist elements of psychology have given way to the cognitive turn. And with or without developments in cognitive and neuroscience, Skinner’s star had certainly lost some of its luster towards the end of his career, particularly, as many like to tell the story, after Noam Chomsky penned a brutal review of his book Beyond Freedom and Dignity in the December 1971 issue of The New York Review of Books. In the book, Skinner argues that our ideas of freedom and free will and human dignity stand in the way of a behavioral science that can better organize and optimize society. 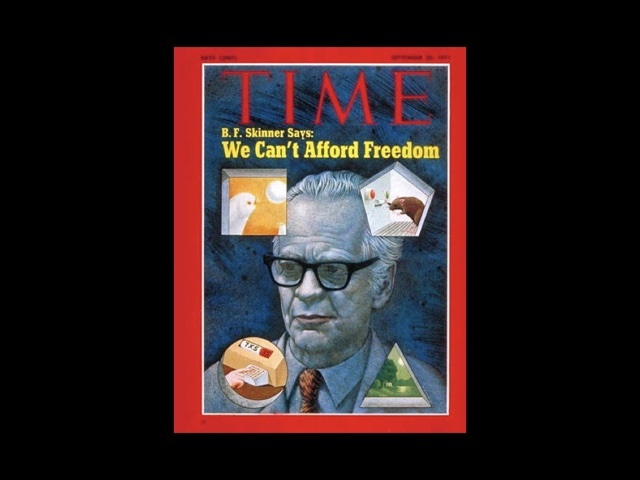 Skinner argues in Beyond Freedom and Dignity that the goal of behavioral technologies should be to “design a world in which behavior likely to be punished seldom or never occurs” – a world of “automatic goodness.“ We should not be concerned with freedom, Skinner argues – that’s simply mysticism. We should pursue ”effectiveness of techniques of control“ which will ”make the world safer." Or make the world totalitarian, as Chomsky points out. 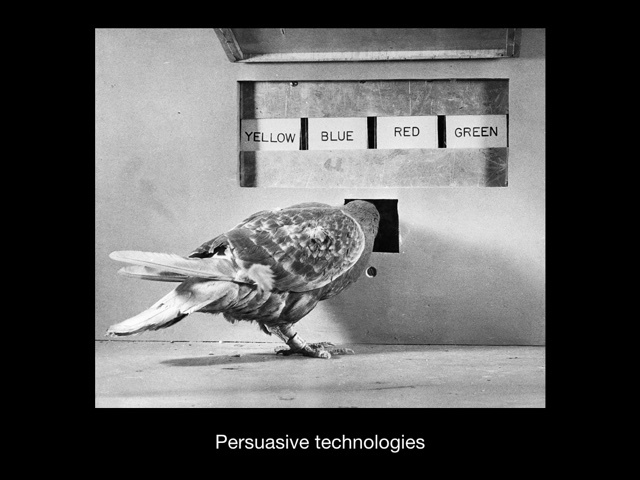 Building behavioral technologies is, of course, what many computer scientists now do (perhaps what some of you do cough FitBit) – most, I’d say, firmly believing that they’re also building a world of “automatic goodness.” “Persuasive technologies,” as Stanford professor B. J. Fogg calls it. And in true Silicon Valley fashion, Fogg erases the long history of behavioral psychology in doing so: “the earliest signs of persuasive technology appeared in the 1970s and 1980s when a few computing systems were designed to promote health and increase workplace productivity,” he writes in his textbook. His students at his Behavioral Design Lab at Stanford have included Mike Krieger, the co-founder of Instagram, and Tristan Harris, a former Googler, founder of the Center for Humane Technology, and best known figure in what I call the “tech regrets industry” – he’s into “ethical” persuasive technologies now, you see.